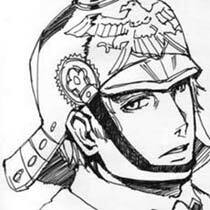 Major Kaminski is a regimental commander ofa Teikoku cavalry squad. Julia's private lover. 28 years old. Kaminski family used to be a prestigious family, but Andrei's father died and left a huge debt, which smashed the family's wealth. Anderi's mother sold him to the Teikoku Emperor's brother Marantsov as a male prostitute. After Marantsov died, he abandoned the family and entered the Teikoku army. Being a gifted officer, he quickly promoted and became a deputy adviser of General Julia.